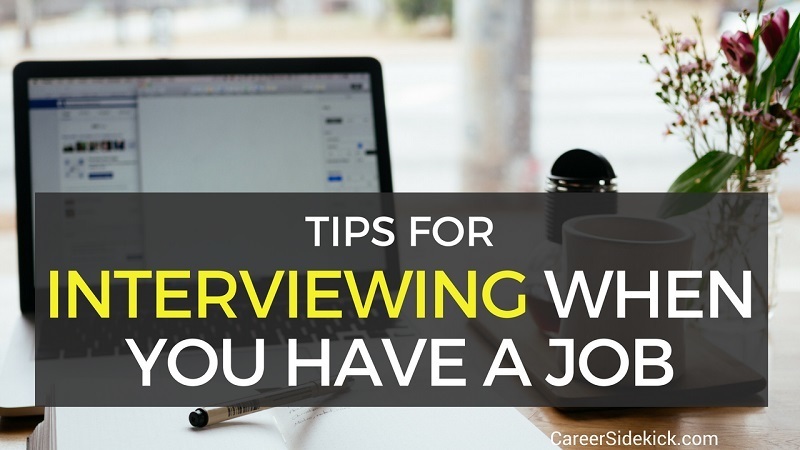 Interviewing when you already have a job is one of the best ways to advance your career. There’s not as much pressure, and companies view it as a good sign that you’re currently employed, so they’re more eager to hire you. Going on interviews while employed can still be stressful, though. In this article I’m going to share my best tips to help you successfully manage your job interviews and job search while you have a job. Job searching while employed is your chance to upgrade your career and salary in a big way. So be specific in what you want, and stick to it. Don’t be afraid to say, “no” to an interview request. Or one of my favorite strategies you can try: Take as many phone interviews as you can, since it’s very easy to schedule them on lunch breaks, coffee breaks, etc., and then be very picky about who you go in for a face-to-face interview with. So do tons of phone interviews, but only say, “yes” to the absolute best companies for an in-person meeting (based on what you learn in those phone interviews). A big part of looking for a job when you have a job is protecting your time and managing your time. I mentioned above that you should be selective, and the only way to do that is to know about each opportunity BEFORE agreeing to interview. So ask for a job description before an interview if you don’t already have it. Ask great questions in each phone interview so you can make a better decision about whether to go in face-to-face if they invite you. You can get a huge list of great questions to ask here. Then you’ll be able to accurately decide which roles make sense to pursue and spend time interviewing for, and which don’t. As an added bonus, making sure you know about each job before interviewing is going to help you answer a lot of questions like, “why do you think you’d be a good fit for this job?”, “why do you want to work here?” and more. If you want more questions you’re likely to hear, and sample answers so you can practice, it’s all in this article. If a company proposes a time that you can’t do, tell them, and ask for what you need. Early in my career I had a company schedule my interviews from 7 AM – 8:30 AM, so I could get to work at 9:30 AM. Getting to work slightly late is a lot better than having to take a full day off. When you’re interviewing while you have a job, you want to save sick days for when you absolutely need them, so ask for early or late interviews when you can. They won’t always say, “yes”, and that’s okay. Have the conversation, and don’t be afraid to ask for what you want. Just be reasonable and if they can’t do it, work with them to come up with something that will work. Getting time off from work to go on interviews isn’t easy. But neither is organizing a hiring manager’s time to interview you (plus anyone else you’re going to meet – because more and more companies are having you meet multiple people before they hire you). So be reasonable, and be willing to compromise. If you make a scheduling request and they simply cannot do it, stay calm and try to understand their needs. If you just think of it as a conversation where both sides are trying their best to make it work, you’ll be able to find a way to get it done. You can use one or two sick days in most jobs before your boss starts getting suspicious that you’re job searching. You can also think about whether you can use one or two vacation days as needed. I mentioned earlier that one strategy to save sick days is schedule early-morning or late-afternoon interviews so you don’t miss a full day of work. So that’s another way to save those “full” sick days for when you really need them. Coming in one hour late (you can say it’s for a doctor’s appointment or anything else), is better than missing a full day. Let’s say they agree to interview you from 8 AM to 9 AM, so you can still make it into work later that morning. Now, normally you’d want to wear a suit for most interviews. But if you wear business casual at your job, walking in with a suit at 10 AM is going to be a dead giveaway that you’re interviewing for another position. Not good, right? Most companies will understand and say it’s okay, and then the person you’re meeting with will know why you’re “dressed-down”. Or, you could always just wear a suit and tie (or full women’s business attire if you’re a woman), and then remove the jacket, necktie (if you’re a man), etc., before going to work, so that you’re not too over-dressed at your job that day. It’s up to you. The point is, don’t be afraid to ask for things and have a conversation to make interviewing more comfortable for you. Looking for a job and going on interviews while employed is going to be a bit stressful, so be ready for that. On one hand, it’s less pressure when you have a job, but the scheduling part is more stressful. And remember you’re lucky to be interviewing when you have a job. A lot of people – and most of the readers of this blog – do not have a job when looking for a job. They have no income coming in and it’s very stressful/difficult mentally. 8. Don’t cut corners on interview preparation! Chances are you’re only going to be able to go on a few face-to-face interviews before your boss figures out you’re job searching. So make the most of them. One way is to be selective and say “no” to interviews that you’re not excited about. I mentioned that earlier. But the other way is to make sure you walk in ultra-prepared and ready to “wow” the hiring manager and turn the interview into a job offer! 1. How to introduce yourself in an interview and answer, “tell me about yourself”… Article + video. Think about how much time and energy it takes to get interviews… from writing your resume, talking to your network, applying for jobs online, sending endless scheduling emails, and finally taking time off from work to go to the interview. So after the interview, doesn’t it make sense to stay organized so that you can follow-up, check for feedback, and thank interviewers for their time to boost your chances of getting get hired? Then send thank you emails a day after the interview, and follow-up emails after 5-6 days if you heard no response. If you have friends at work, it may be tempting to tell them you’re interviewing, but don’t do it! Gossip spreads fast in most work environments. They might think they’re just telling another friend harmlessly, but then that friend could tell a third person and before you know it – your boss finds out. Then what if you don’t end up accepting a new position? It looks horrible. So just play it safe, and tell your friends AFTER you find a new job. They’ll understand if you tell them you were waiting because you wanted to keep it professional and wait until things were final. In fact, as another tip, I’d actually recommend handing your 2-week notice or resignation letter to your boss before telling friends too. You do NOT ever want to risk your boss finding out you’re resigning, via gossip, before you formally hand in resignation. So after you’ve accepted a job offer, resign formally, then tell your coworkers and friends. If you follow these tips you’ll have a lot less stress interviewing when you have a job, and you’ll be more successful in those interviews. As a final note, if you do have interviews coming up and don’t want to leave anything to chance, I’ve created a new guide where you can copy my exact step-by-step method for getting job offers. You can get more details here.